Candidates in the New York City mayoral election named their priorities for the City University and affirmed their commitment to public higher education last night at a forum hosted by the Professional Staff Congress. John Liu and Bill Thompson attended, Thompson arrived late. "Rather than ask you to live in uncertainty any longer," Bowen noted, "the PSC worked with CUNY to negotiate an extension of the current adjunct health insurance program through the Welfare Fund." "Coverage through the Welfare Fund is not a permanent solution," Bowen added, "and the union will continue to work with CUNY on a long-term structural solution [placing adjuncts on a public plan]." May Day is an annual celebration of our collective strength as working people and our shared commitment to a better world. This year’s May Day event begins at 4:30 PM on Wed., May 1 with a rally in Union Square followed at 5:15 PM by a march down Broadway to City Hall, where PSC president Barbara Bowen will be among the speakers. May Day is an annual celebration of our collective strength as working people and our shared commitment to a better world. This year’s May Day event begins at 4:30 PM on Wed., May 1 with a rally in Union Square followed at 5:15 PM by a march down Broadway to City Hall. You can download a flier and read a message about May Day from PSC Treasurer Mike Fabricant and Solidarity Committee Chair Jim Perlstein on this page. "The conflict spilled into view this week, with ads published in several newspapers" reported WNYC's and National Public Radio's "All Things Considered" in a story about Pathways on March 21st.. Click here to listen to PSC President Barbara Bowen and CUNY Provost and Executive Vice Chancellor Lexa Logue interviewed by WNYC's Amy Eddings. AD CAMPAIGN SAYS: LISTEN TO THE FACULTY, CUNY. DON’T SACRIFICE QUALITY. New York—Dr. Blanche Wiesen Cook, distinguished professor of history at John Jay College, and Dr. Manfred Philipp, professor of chemistry at Lehman College, are featured in a new ad campaign opposing Pathways, CUNY’s new core curriculum. The ads express opposition voiced by thousands of CUNY professors over the last two years. 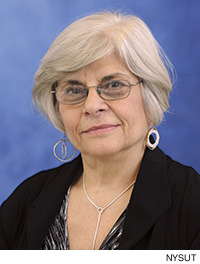 PSC President Barbara Bowen sent a letter supporting Brooklyn College President Karen Gould's defense of academic freedom and the Brooklyn College Political Science Department in their co-sponsorship of a forum on the BDS movement, which calls for boycott, divestment, and sanctions against Israel. Gould’s defense of academic freedom drew fire from a group of politicians (their letter) who wrongly equate the political science department’s co-sponsorship of the forum with an endorsement of the views expressed by the BDS movement. Celebrate CUNY Research Foundation Day! Negotiate a Fair Union Contract! New York--Mayor Bloomberg proclaimed Thursday, January 24, 2013 as CUNY Research Foundation Day in the City of New York and Governor Cuomo has issued a citation celebrating the Research Foundation’s 50th Anniversary. The CUNY Research Foundation is a private entity that manages private and government sponsored programs at The City University of New York (CUNY). The Research Foundations’ Central Office Workers represented by PSC/CUNY would celebrate too, if they had a fair contract offer on the table.